Analytical Grammar produces curriculum to encourage language mastery. One of their products, with the same name, Analytical Grammar has been a wonderful help for us this summer. Geared for 6th grade and up, this program costs $94.95 for both the Teacher Book and Student Book. The Student Book is consumable and an additional Student Book can be purchased for $49.95. So why grammar at a later age? Shouldn't they already have had a plethora of grammar by this point? For many sure, that is probably the case. For my 15 and 12 year old, not so much. We used such a variety of curriculum for them as they were growing, to try to find that 'just right' fit. I think in the transition of changing curriculum we lost some of the basic knowledge of grammar that is now hurting us as they get older. I opted to use the Analytical Grammar program with my 15 year old who is going into 10th grade. He knows some of the basics, but much of what Analytical Grammar has in the later units, he has never gotten a grasp of. The first 10 units focus on parts of speech and parts of a sentence with some basic diagramming of sentences. These units were a bit easy for my 15 year old, Mackinley, but I felt they were good reinforcement as well as confidence builders for the later units to come. Each unit can be completed in a week, with a test at the end. I have not always been a big 'tester' and this has given us the opportunity to be able to test and keep track of grades as well. We plan on tacking Analytical Grammar to his basic English class for the upcoming school year and including the grades as well. Each day's lesson only takes about 20 minutes at the most and the units build off of one another in a great sequential and logical approach. There is an option for the younger kids of taking up to 3 years to complete Analytical Grammar. The intro to the Teacher Book explains a basic outline for doing this as well as utilizing it for a year. It is recommended for the 6th and 7th graders. If I decide to go with Analytical Grammar at some point with my 7th grader we may use this approach. I do like the consistency that comes with getting it done in a year though. We are going the one year route as Mackinley is getting into more report writing and learning additional writing skills that grammar is going to be crucial for. Units 11-17 go over phrases and clauses, some were even a good refresher for me! Units 18-34 tackles all things punctuation and punctuation usage. This is really for Mackinley the meat of the program. 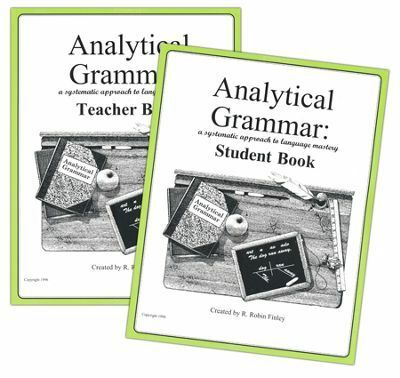 I am looking forward to continuing Analytical Grammar this school year for him and hope that it will really hone in his writing skills grammatically.